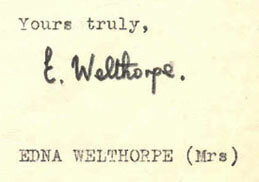 In the 1950s Orton created an alter ego, Edna Welthorpe, guardian of public morals and inveterate letter writer. Orton used Edna’s letters to goad authority into revealing their own innate idiocy and priggishness. Orton was not above writing letters criticising his own plays in order to generate controversy (and column inches). A letter of complaint from a JHP Joy was passed to Orton from the Criterion Theatre and Orton responded as Edna, asking if he will join her in setting up a meeting with the Lord Chamberlain to protest about the play. Web Design © Alison Forsythe.